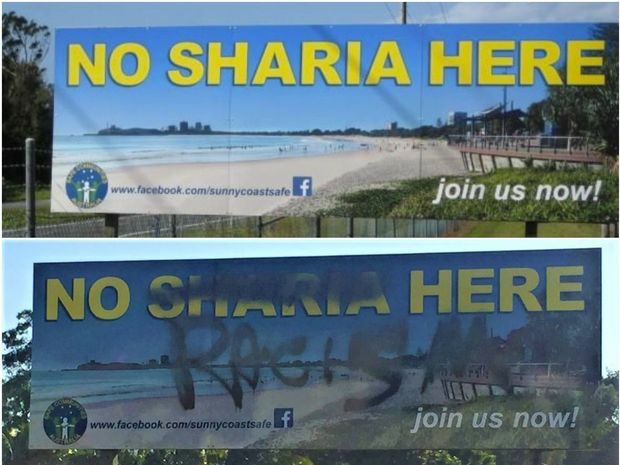 A controversial billboard on Queensland’s Sunshine Coast with the line “No Sharia Law Here” has attracted the attention of vandals. The three-year-old billboard at Maroochydore was commissioned by the Sunshine Coast Safe Communities (SCSC) group and has been sprayed over with “no racism here”. Although the vandal is yet to be found, the goodly folk at the SCSC are none to happy about their spray-painting handiwork. SCSC secretary Raewyn Hutchins told the Sunshine Coast Daily: “We think it’s more of an indication of the lack of understanding of people who don’t know what Sharia law is about, and who use strange tactics in order to get their message across. “It shows a lack of freedom of speech, we think that there is a closing down of freedom speech, and a closing down of sensible and also well-mannered-old debate in this country. “We don’t know whether or not they trespassed on private property where the sign is, or whether or not they stood on the roadside and used a long stick,” Hutchins said before adding the billboard had received a great deal of support from locals and this was the first time it had been defaced or attacked.